Are You There, Bates? It's me, Mickey. If it were up to me, every weekend would be halloween. That would take away some of the mental anguish and cognitive dissonance that comes along with finally choosing a costume. This year, I went through several phases. First, I wanted to do a Nash House tetris block group costume, then we changed it to Pokemon trainers (in which I, of course, would be Ash Ketchum), then, I think we were going to put on different patterned scrubs (K.I.S.S. Keep It Simple, Stupid). But somehow, after all of that planning and laughing and (apparent) delusions of grandeur, I settled on being some variation of a puppy dog with one other friend of mine (puppy BFF’s was the official name). Now obviously, I’m regretful of my bland choice, but this is what happens when you don’t make decisions fast enough. I want to tell everyone “This is not reflective of my creative abilities!” or “Let me try again next weekend!” but its too late, the pictures are up and you’re pegged: Mickey chose to be a dog– super lame. It’s fine, whatever, I shouldn’t care except for the fact that it kills me inside. My one chance to become another entity in this limited world. And come to think of it, I did it last year too. I was one of 100 downtrodden Super Mario’s on Bates College campus, our costumes merely a kick-me sign; a signet of failure. If you can take one thing from this blog, it’s TAKE CONTROL OF YOUR LIFE: SPEND TIME ON YOUR HALLOWEEN COSTUME. (and for future reference, that’s the only time I’ll write in all caps, it’s a pet peeve of mine). this is how i really felt. underneath it all. 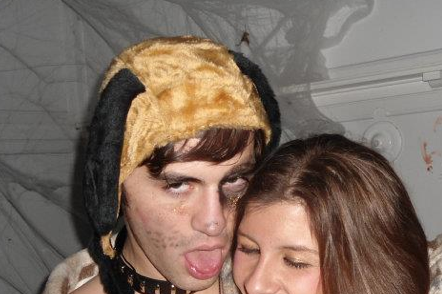 I’ll stop beating myself up and instead focus our attention on how great my Halloween was in spite of this fiasco. Bates Halloweens are magical and often times when it comes to ratios of Halloween costumes, funny trumps slutty. It’s an important distinction to make I think, and something that’s indicative of the population at Bates. It’s a place for those of you who spend time on your costumes, who put blood, sweat, and thought into it rather than slap on some lingerie and say “I’m a mouse. duh.” That’s kind of what I did, regretfully. For example, one house made their home into an Abercrombie Store (the most horrifying): cabana shades over the windows, shelves with abercrombie on them, people decked out in abercrombie, the perfume . It was honestly amazing. It was one of those proud Bates parent moments: props. There was a haunted house on campus which I told people I’d go to, but I pretended to forget. I don’t like them and I don’t understand them. Those and drive-through car washes are the two scariest things to me (and clowns, see below). I don’t like being herded through the dark while humans scream at me periodically: annoyingggg. I want to ash my cigarette on them. I’d almost prefer it if they actual ghosts and ghouls. Scarier? Yes. But at least I’d have some of those hard questions about the afterlife answered. Commons had one too, which I also told people I went to (and didn’t). At any rate, if you like haunted houses, I heard this one was particularly horrifying, and I don’t doubt it. The Halloween Dance, however, was especially precious. I always look forward to it: a masquerade ball of sorts, anonymity and imagination galore (at the risk of sounding like Willy Wonka). I ❤ Traditions. p.s. one in particular which shall not be named, I wouldn’t want to spoil the surprise for those of you unaware. I forgot to post these posts last week. They’ve just been sitting in a word document, so I’m just going to write the dates at the top and post them in succession. The break could not come at a better time. Honestly, while these short breaks may be weird and lonely (since no other school seems to overlap quite the same) they always seem to come at the perfect time. Saved by the foliage, right when the workload has just been getting to you. Say what you will about the unprecedented time, it’s great. And maybe its best we stay away from our high school friends just a little longer (this is true more for some than others). I find we fall back into weird juvenile clique-ness. It’s like a bizarre social regression, and I feel so liminal. I learned in my short term class (I know, right?) that elderly people are, on average, happier because they prune off all the social excess. They’re left, then, with something I imagine to be reminiscent of The Golden Girls. It sounds amazing: loose-sweaters, eye-rolling, and great friends. That’s my life goal, starting now. I spent a lot of time in New York City, my place of origin, and I stayed with a friend at Columbia for a little bit. I sat in on my friends Latin American Dance class and learned a bit about perceptions of Haitian voodoo during the Haitian revolution. And as I sat there, wishing I could dance like them-posessed, passionate- I felt like I was back in a Bates classroom. It’s so interesting how unfeasibly different it is going to school in a city, but even as I relished in my unabashed love for New York and starbucks and not having to drive (since I can’t)–I missed Bates. Only in Maine can I achieve my Golden Girls life. There’s a pull here, you really can’t escape it. You wish and wish for break, but the moment you leave you feel like you’re missing something: an event? a piece o’ ya’ heart? who knows? The Comedy Central Roast of Charlie Sheen was a bittersweet affair. It is as the name of the show suggests—to roast, to burn at the unabashed punch lines of professional clowns and, simultaneously, to bask in one’s achieved fame. And as a result, being an audience member at a roast is to know what it’s like to be uncomfortable for an hour and a half. EVERY comic takes the joke to far: perpetuating racism and sexism, guffawing at drug addictions and botched plastic surgery (Pamela Anderson’s Roast comes to mind), jabbing at failed celebrity parenting (a favorite among the Charlie Sheen Roast). However, as Amy Schumer, the winner of the latest season of Last Comic Standing, sauntered onto stage with her (it turns out, wildly misleading) cherubic charm I thought my clenched body and bated breath might shake free. She turned out to be the meanest person at the roast. hands down. I don’t think it would be a stretch to say that only a borderline sociopath would tell Patrice O’Neal that “this [was]n’t just a roast for Charlie Sheen, but also a farewell party for Patrice’s foot,” referring to his African American predisposition for diabetes. She subsequently wished Steve-O’s death over Ryan Dunn’s (recent) one and, finally, called out William Shatner for being overly bloated, accusing Priceline of “paying him in empanadas.” If you’re not familiar with these comedians, it’s no matter, just trust me when I say she was crushing combine; a real force to be reckoned with. She was gracefully unrestrained, certainly captivating— an “up and coming” as they say. When I found out she was coming to Bates, I was confused. A higher academic institution might not always choose Amy Schumer, a controversy-driven, off-color comedian to be entertainment. Perhaps this is one of those glorious instances where we carry the intellectual conversation out of the Bates classroom. We’re supposed to analyze her show. That sounds right. But honestly, I was more scared than confused by her arrival; terrified of this chimeric cherub. I understood then why people were afraid of clowns (minus the disturbing make-up and geriatric moo-moo and the squirting lapel). It is more the fear of being laughed at, a fear of the lack of social niceties. But I was obviously going to her show regardless. You could call me a glutton for punishment. Me and some friends, enjoying the clown. But as this picture would have it, I adored her and her show. I learned to appreciate her for what she (and most stand-up comics) were: a necessary evil. Yeah, she struck a few of my cords, but she was so thoroughly relentless that she left no rock unturned, no college student monetarily undisturbed. At the very most a tear of shame/laughter was shed. It felt both victimizing and surprisingly fair, and let me tell you: I’m a big believer in poetic justice. Her raunchy “college kid” lineup was appropriate and well received it seemed. 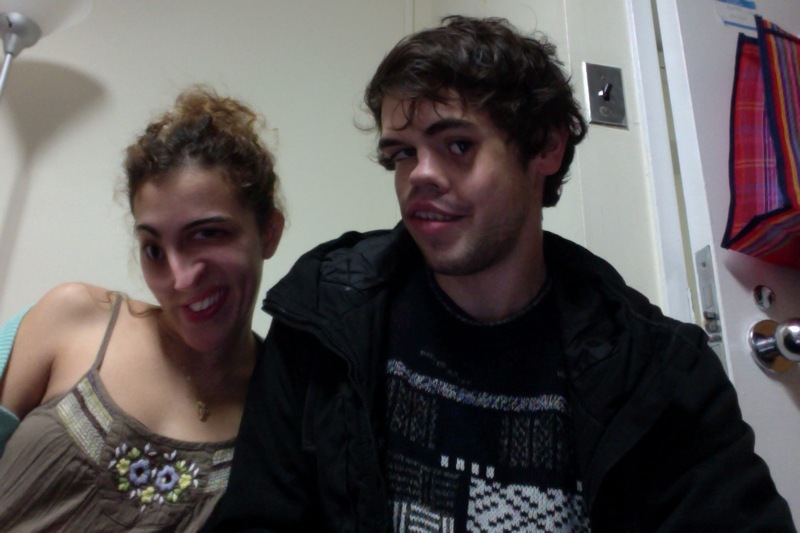 She even alluded to the fact that we were an attractive bunch (and I’m not one to shy away from shallow compliments). My fear of clowns has been significantly subdued after this show, and to take this a step further, I think Bates should try to lure more sardonic urban comedians up to Lewiston. It makes for a funny dynamic. 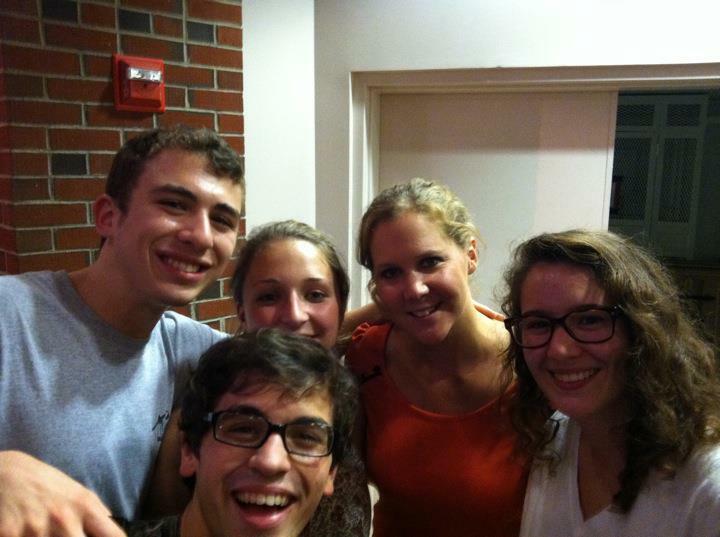 The kind, the just, the fair: Amy Schumer. p.s. she’s going to be in a movie with Steve Carrell soon, it should be good. I can see the bobcat shape now. You might not believe it yourself at first either. You might just see a series of jutting triangles, maybe an oversized electric razor, certainly a true shrine to the architecture of the 70’s (i.e. elementary shapes). You might tilt your head a little to the left (to no avail) and wish and wish that you could JUST. see. it. It’s an optical illusion you’ll tell yourself for a while, there is no way that building is a bobcat. But after a while of being at Bates, you’ll have that “aha” moment. Red becomes garnet, boys become men, the library becomes a cat. Upon first seeing the library, I felt disdain. Ew. so 70’s, so rigid, such a non sequitur. I covered my periphery as I passed it, in an effort to pretend it didn’t exist. Yes, thatdramatic. I mean, unfortunately it is the library and I am a student. One way or another, It would have to become a part of me. At east the inside had that quaint, maine comfort. The so-called bobcat structure rises triumphantly over the trees. We are Bates. I was told once that Ladd library is the only true example of architecture on campus: because it tries to be something other than its original function. Whether or not its accurate, I kind of like to think of it that way now. 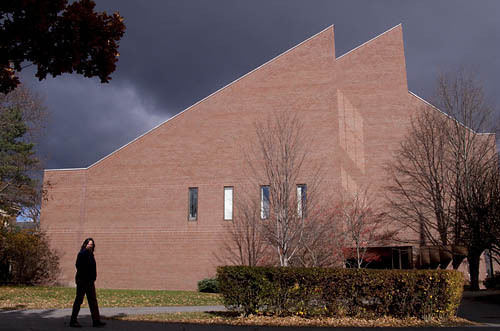 It’s unique, something distinctly “bobcatian.” More than a 70’s architectural catastrophe, it is a symbol of commitment; commitment to the mascot, commitment to collegiate pride, commitment to Bates. It rises victoriously through the trees — a prideful cat. I’m starting out on this more pensive note because I’ve been focusing a lot on change and assimilation and goodness of fit. That, and I’ve been cooped up in the library for a week (midterms) and I can’t stop thinking about it. To play on Julia Roberts’ words from Eat, Pray, Love: “I’m having a love affair with my library.” In terms of the college process, we have such specific, unwavering expectations. And I think its important to realize that these expectations change, we want them to change. Yes, I wanted an old, palatial stone library. But we adjust our non-negotiables. I can’t imagine Bates without the flare of the bold bobcat. And I should note that It’s not so much about compromising as it is about adopting a rare, new aesthetic. I bring all of this up because that’s what my blog will focus on: a unique and singular series of Bates aesthetics. It’s largely the little things that make college great, that create a sense of collegiate identity. Talking in extremes, trying to generalize the population ( and even the architecture) wouldn’t do any school justice. We’re students: we observe, we experience, we analyze.